Now let’s describe each of them. Starting from the version 4.1, dhtmlxGantt becomes more accessible for using it in the web applications for the people with some types of disabilities. For these purposes, keyboard navigation, WAI-ARIA and high-contrast themes are released. To increase the accessibility of web pages and UI, dhtmlxGantt starts supporting WAI-ARIA based on the common standards. Now developing a web application and enabling WAI-ARIA attributes in your code, the screen reader users will be able to use Gantt Charts to the full extent. Two more skins appear in dhtmlxGantt: black contrast theme and white contrast theme. Both of them passed the contrast tests and are appropriate for people with some types of visual disabilities. This feature will be useful for the users who cannot use any pointing device, and for those who feel more comfortable to navigate Gantt via keyboard. 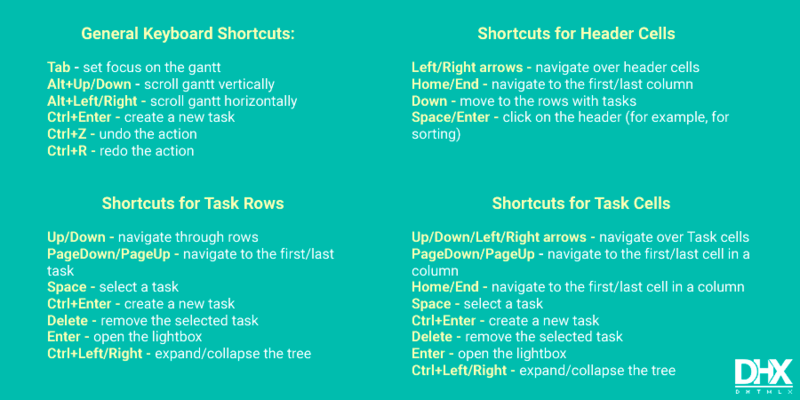 So you can enable keyboard navigation functionality that includes a set of shortcuts keys to control the component from the keyboard without using a mouse or a any pointing device. Open the sample and try yourself. What is more, keyboard navigation functionality is quite extendable so you are welcome to customize it to your needs and add your own shortcuts. The supporting information about how to enable this functionality and other details can be found in our documentation. Since dhtmlxGantt 4.1, auto scheduling and critical path calculation features are significantly improved so that all the known problems with these functionalities are solved. Moreover, improvements made on timescale rendering and worktime calculation will provide you much faster gantt chart. You don’t need to enable any modes for this, enjoy the performance all the time. This update also includes bug fixes and small improvements. More detailed information about this release you may find in our docs. PRO users can login to their Client’s Area or wait a bit for the official newsletter with the download link. The users of the Standard Edition may download the package from our website or update via CDN. We hope that you enjoy our new Gantt 4.1! Feel free to leave your thoughts in the comments section, we are looking forward to hear your feedback! This was really an flexible and useful post which will attain the entire accessibility support. Thank you for your exclusive post. Really great to see you are working on Accessibility with your products…huge kudos! We would love to see Accessibility baked into Scheduler! Thanks for the feedback, Chris! We’ll consider adding the accessibility support to dhtmlxScheduler as well.